Flying High! is the second of two readers in Stage Four of the Rainbow English Programme. 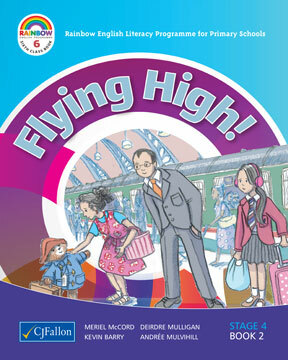 Each reader contains 20 extracts from published children’s literature, 10 factual pieces of writing and 10 poems. Each extract and fact piece is followed by a series of activities comprising:comprehension, vocabulary, word study/phonics, grammar, punctuation and the writing process. Flying High! is accompanied by a ground-breaking Portfolio Book that reinforces the comprehension, vocabulary, word study/phonics, grammar/punctuation covered in the core book. The teacher’s notes that accompany Flying High! is feature a comprehensive week-by-week, month-by-month scheme outlining all elements included in the book.